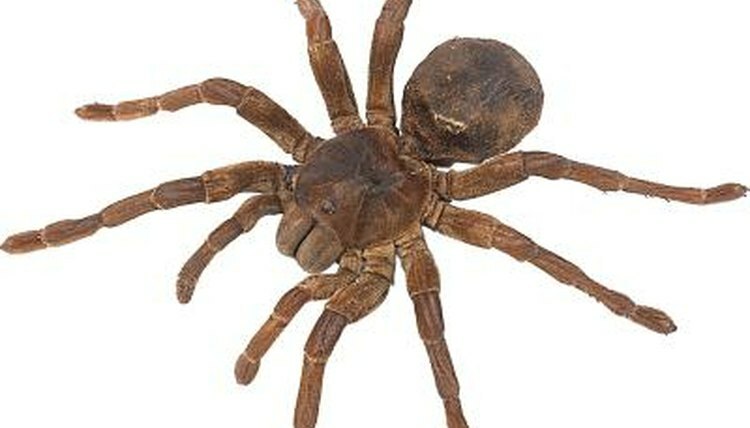 The Theraphosa blondi, commonly known as the goliath birdeater, is the world’s largest spider. Female leg span can reach 12 inches. Females can live more than 18 years. Males are smaller and have shorter lives. Because of their size and aggressive temperament, consider keeping one as a pet only if you have extensive experience with tarantulas. Theraphosa blondi is native to the northeastern part of South America. They live in tropical rain forests around the Amazon River, spending the dry season in burrows and climbing trees to escape flood waters during the rainy season. Except during periods when the ground floods, goliath birdeaters live in burrows, which they surround and coat with silk. They dig holes with their fangs or they take over abandoned lairs. Compensating for the spiders’ poor eyesight, both the silk around their burrows and the spiders' own hairs vibrate when prey approaches. They dart out to bite the prey, then retreat to dine. In captivity, a burrow or hiding place will help provide a secure environment for a goliath birdeater. Pet theraphosa blondi spiders require a tank or terrarium that’s at least three times larger than their leg span, and a lid that firmly locks in place. Depending on your spider’s size, you might need a habitat up to 30 gallons. Supply the spider with at least 4 inches of substrate and preferably more so she can dig a burrow. Substrates such as bark, rain forest blend and vermiculate are usually available at pet stores. You also can provide your spider with a shelter, such as a log or a hollow aquarium rock, where she can hide aboveground. Finally, she needs a small, shallow water dish. Because goliath birdeaters live in hot, extremely humid areas, they need a similar environment in captivity. The tank's temperature should remain between 70 and 85 degrees Fahrenheit. Don't use a heat rock, since spiders can burn themselves on them; instead use a heat lamp or other external heat source. Mist daily to maintain 80 percent to 90 percdent humidity, especially when your spider is molting. If the air is too dry while she’s trying to wriggle out of her old exoskeleton, she can die. When you have questions about maintaining a safe, healthy environment for your pet, talk to a vet who specializes in tarantulas and large spiders.